Pretoria (VNA) – Vietnam’s traditional culture, tourist potential, festivals and standout cuisine were introduced to international friends at a culture week held by the Vietnamese Embassy in South Africa on August 3 in Johannesburg city as part of activities marking the 50th founding anniversary of ASEAN. The event was attended by officials and staffs from ASEAN member states’ embassies, officials from the Ministry of Foreign Affairs, authorities of Pretoria and Johannesburg and local people. 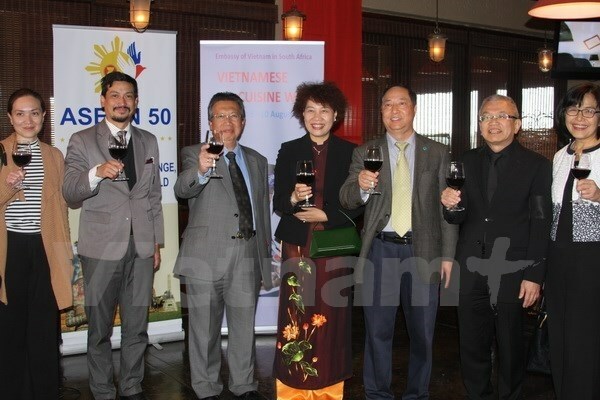 Along with promoting political, economic and trade relations between Vietnam and South Africa, it is necessary to popularise Vietnam’s culture and tourism so South African people can better understand the Southeast Asian country, said Vietnamese Ambassador to South Africa Vu Van Dung.